When the velvet trend first came back I thought to myself, not again. I lived through the terrible velvet clothes of the '90s and wasn't in any hurry to repeat it. Eventually, I caved. First, I bought a cute little blue velvet dress, not this winter but last. A couple of months ago I bought a velvet tee and loved it more than I expected. It's super soft and adds an effortless luxe feel to any outfit. 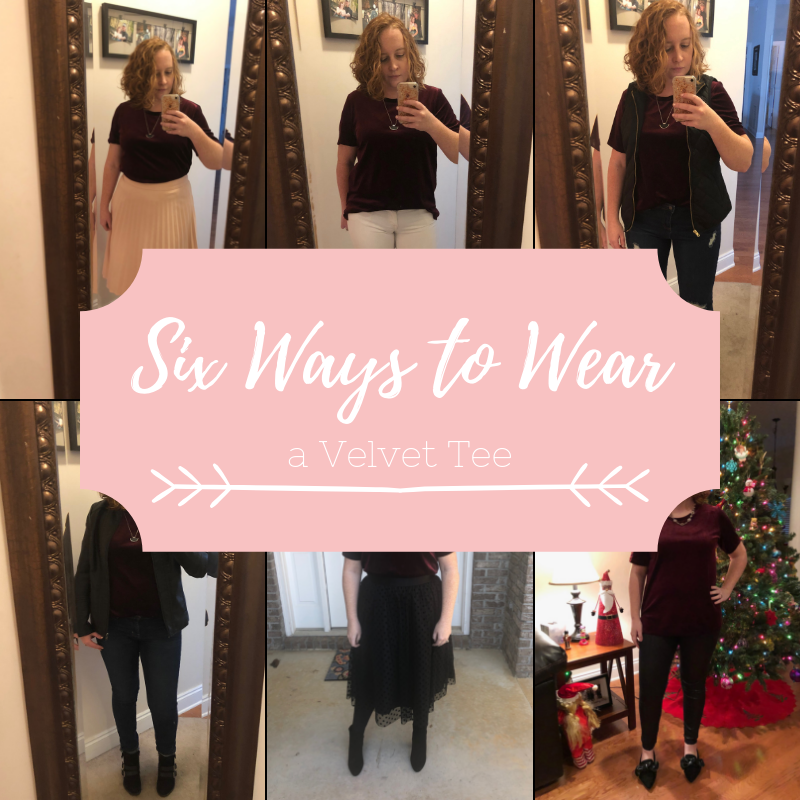 I've been challenging myself to find more ways to wear things I already have, so today I'm sharing Six Ways to Wear a Velvet Tee from winter to spring, fancy to casual. My exact shirt is sold out (except for a pretty champagne color in plus size) but I have some pretty options for you at the bottom of this post. I wore this to a family Christmas party (original post here). I wanted to be comfortable but feel festive at the same time. It's hard to tell in the picture but my leggings are sparkly, with a slight silver shine. I wore this on a regular day (original post here) but there's no doubt this outfit could be worn to a party or on a date. The mesh skirt, tights, and sleek black boots make this ensemble polished all over. I wore this on a magazine delivery day. The velvet made this outfit feel more put together than a simple jeans and tee while still being comfortable for a day of driving and walking. This outfit is much like the previous one but the vest, distressed jeans and flat booties make it even more casual. I like when an outfit bookends. Lucky for me I have a pair of heels that are the exact same shade as my shirt. Whether you choose a solid colored skirt with feminine details like pleats or a printed skirt, the velvet will add just the right amount of fancy. Perfect for the office or date night. How do you wear a velvet tee in warmer weather? By pairing it with light-colored jeans and booties, or pants and flats/heels for the office. I want to know what you think! Would you wear a velvet shirt?